Phil Ascough, author of the excellent Kissing The Badge, covers the not so close local derby between Middlesbrough and Hull City. Two teams with more in common than many people realise met in the Championship’s big Boxing Day clash. Don Revie was born in Middlesbrough and later played for Hull City before reaching the pinnacle of the game as manager of the team that fans of Boro and Hull love to hate. Steve McClaren’s first club as a player was Hull. His first as a manager was Boro. Dean Windass, Andy Payton and George Boateng are among the players who have starred for both clubs. Another is Nick Barmby, installed as caretaker manager at Hull after the departure of Nigel Pearson, another Boro legend. Similarities too in sponsorships, with both sets of shirts carrying the logos of businesses that will ease your cash worries in return for your treasured possessions. My missus encountered the Cash Converters crew on the next table to her at the works Christmas night out. They had all the brightest bling and the latest mobile phones, and more than likely all snaffled by the staff before it got anywhere near the shelves for general sale. And yes, there’s a bargain basement feel to Boro and Hull compared to their years of Premier League excess, but they have every chance in a competitive division where the big names of West Ham and Leicester are not exactly blazing a promotion trail. The Boro view, as gleaned from a chap selling the excellent and long-standing Fly Me To The Moon fanzine, is that the team are punching above their weight and need a few key signings in the window if they are to avoid running out of steam. The Hull view, based on my frequent visits to the KC Stadium, post-match chats with diehard fans and a trip to the Riverside with some luminaries of local radio, is that the team are punching above their weight and need a few key signings in the window if they are to avoid running out of steam. More similarities then, and they extended to the match itself. Both played an extra man in midfield, Boro boss Tony Mowbray claiming he broke from the norm in an attempt to match Barmby’s preferred approach. But Hull’s system has developed under Barmby into a more inventive and attacking approach, with Aaron Mclean, Robbie Koren and Cameron Stewart pushing forward in support of Matty Fryatt. It’s reminiscent of Reading’s record-breaking side of 2006, when interchanging and overlapping midfielders who were all good on the ball provided the engine room for an historic promotion campaign. But Hull struggled to get the speed and tricks of Stewart into the action and they need to be sharper in front of goal. They probably should have had a penalty when Fryatt gave Matthew Bates the slip and bore down on the keeper only to have his heels clipped. But even some Hull fans suggested Fryatt took too long to get his shot away, having previously squandered a golden chance presented by a wayward header from Nicky Bailey. When Jason Steele in the Boro goal was tested, notably by a powerful low drive from Andy Dawson, he was equal to it. That was the highlight of the afternoon for City’s veteran left back, who had survived a penalty claim himself earlier in the game – the ref’s assistant indicating Dawson had chested the ball – and who was stretched, collecting a yellow card along the way, under pressure from Justin Hoyte and Faris Haroun. But with Boro lacking Hull’s flair and repeatedly over-hitting the final pass, all the evidence of the first half pointed to the league table placings being reversed. There was little change in the second half in terms of chances created, but significantly Boro emerged quicker, more combative and closer to their opponents, suddenly denying them the space to play the flicks and through-balls of the first half that would surely have broken the deadlock in Hull’s favour. Peter Gulacsi in the Hull goal was untroubled by Boro’s few strikes on targets and Paul McKenna, Fryatt and Koren all missed with half chances as the game headed for a draw… until the 87th minute when Barry Robson cut inside on his left foot and from 25 yards – or 35 taking into account the angle – unleashed a shot that flew into Gulacsi’s top left-hand corner. Barmby reckoned his keeper shouldn’t have been beaten by a strike from such a distance. Both managers disagreed on the penalty decisions. Hull slipped to fifth, Boro climbed to second and then dropped back to third after West Ham’s point at Birmingham. A crowd of 27,794, including 2,704 away fans, was Boro’s highest of the season but none will be getting too elated or despondent because with 23 games played it’s literally only the halfway stage and both teams are much better placed than they were a year ago. 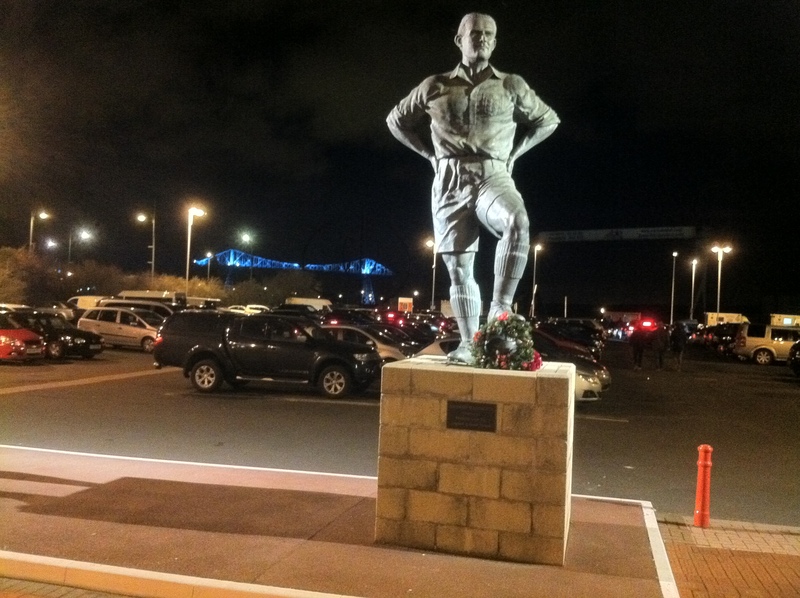 This entry was posted in nPower Championship and tagged Hull City, Middlesbrough, nPower Championship, The Riverside. Bookmark the permalink. And will both these teams have promotion back to the Premier league in common too I wonder? More to the point, if they do, are either of them yet ready for the step up?